Mr. Hikotaro Yazaki, born in Tokyo, once studied mathematics at the Sophia University. But as he could not forget the desire for music, he entered again into Tokyo National University of Fine Arts and Music, and graduated in 1970. From 1970 to 1972, he was appointed as the Apprentice Conductor to the Japan Philharmonic Orchestra under Seiji Ozawa. In 1972, he made a concert tour in Switzerland as a conductor of the Tokyo Youth Symphony Orchestra. 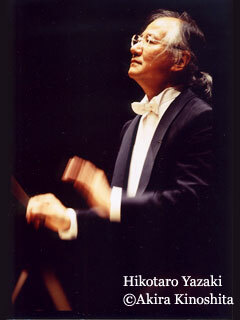 Mr. Yazaki had since furthered his conducting studies in Europe with Hans Swarowsky, Franco Ferrara, Sergiu Celibedache, Zdenek Kosler, and Pierre Dervaux. On those days he received several awards such as laureate at the John Player International Conductor Award (1974), at the Concours International de Besancon (1975) and at the Rassegna Internazionale “Gino Marinuzzi” (1976). Since then, several titles he has held include: Conductor at the Tokyo Symphony Orchestra (1979 – 1988), Principal Guest Conductor at Norweigian Radio Orchestra (1986 – 1988), and Principal Guest Conductor at Hofer Symphoniker Germany (1986 – 1989) and also Music Director and Principal Conductor at Hofer Symphoniker (1989 – 1996). Since 1994 he has been the Principal Guest Conductor of the Orchestra de Chamber National de Toulouse. Since 2000 he has been the Honorary Conductor of the Bangkok Symphony Orchestra, since 2002 the Principal Guest Conductor of the Tokyo City Philharmonic Orchestra, and since 2005 the Music Director and Guest Principal Conductor of the Nusantara Symphony Orchestra, Indonesia. He is seen often with numerous orchestras in Europe such as the Royal Philharmonic Orchestra, the BBC Orchestra, the Oslo Philharmonic, Orchestre Colonne, the Nouvel Orchestra Philharmonique, the Orchestre des Concerts Lamoureux, the Orchestre de Lyon, Orchestre d’Avignon, the Orchestre d Capitole de Toulouse, the Orchestre Philharmonique de Monte-Carlo, Opera de Paris, Opera Royal de Wallonie, the Orchestre de la Suisse Romande amongst others. In 2001, for his continuous efforts at contributing of French music and culture, he was awarded the “Chevalier dans l’Orde des Arts et des Letters” from the French Government. In 2002, he received music award from Exxon Mobil Music Awards. In 2007 he was appointed as special Guest Professor by the Nihon University, College of Art, in Tokyo. In 2008 he was awarded the “Officier dans l’Order des Art et des Lettre” by the French Government. In 2008 a special medal was given to him for the performance of “Requiem” concert as remembrance of Her Royal Highness Princess Galyani Vadhana of the Kingdom of Thailand. Copyright © 2011 Yazaki et ses amis, all rights reserved.